Saudi Arabia's Mohammed bin Salman was greeted with a booming 21-gun salute in Pakistan Sunday, as the powerful royal scion kicked off an Asia tour months after being tarnished by his alleged links to the murder of a journalist. The crown prince, widely known as "MBS", launched his diplomatic trip in the capital Islamabad, where he was set to sign a raft of investment deals believed to be worth billions that Pakistan hopes will provide welcome relief to its teetering economy. 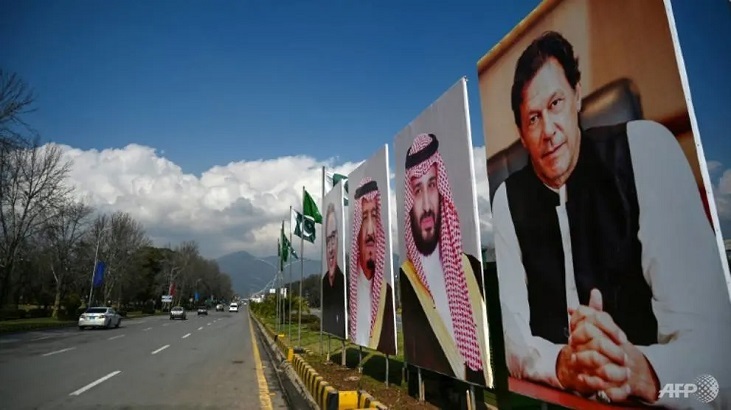 MBS was warmly embraced by Pakistani Prime Minister Imran Khan and powerful army chief General Qamar Javed Bajwa as he stepped onto a red carpet flanked by an honour guard at a military airbase near Islamabad. Hours ahead of the crown prince's arrival, Pakistan dismissed Delhi's accusations, calling them "well-rehearsed tactics from (the) Indian playbook after such incidents in the past". Turkey said Friday it has not yet revealed all the information it has uncovered in the extraordinary case, which launched a global wave of revulsion and profoundly tarnished the crown prince's reputation. Li Guofu, director of Middle East studies at the China Institute of International Studies, a government-affiliated think tank, noted that the Khashoggi case continues to cause indignation in Western countries, so visiting them would have been "inconvenient". Pakistan is facing a serious balance of payments crisis and hopes its longtime ally Saudi Arabia will throw the struggling economy a lifeline, specifically in the form of a $10 billion investment in a refinery and oil complex in the southwest of the county. Prime Minister Khan has already visited Saudi Arabia twice since coming to power last summer.